This lovely picture book explores the seasons with young readers, focusing on the weather, activities, and colours of summer, autumn, winter and spring. It is wonderful to see a book about seasons for Australian children with words that are familiar – ‘autumn’ instead of ‘fall’ for a start – and activities that young readers will readily relate to – swimming, barbecues with family, playing at the park, picnics and playing cricket and soccer with friends. The text by Helen Martin and Judith Simpson is simple yet manages to capture so many of the ways the seasons connect with our senses. Cheryl Orsini’s appealing illustrations lead readers through a variety of images for each season as well as offering occasional activities, such as counting the colours in the rainbow and matching mother and baby animals together. The illustrations are bright and colourful, drawn in a simple style that nevertheless offers lots of details for young readers to discover. 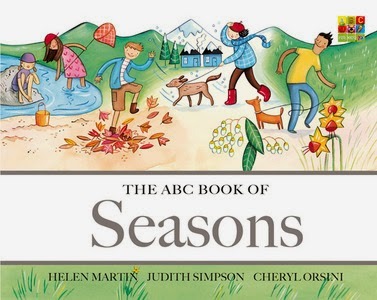 The ABC Book of Seasons is a wonderful book for home or preschool and kindergarten classes talking about the seasons. I can imagine children and parents having wonderful conversations about the many things that change as we progress through the seasons and all the things they love to do at different times of the year and.